New Miele EcoFlex Dishwashers - Are the incremental updates worth the money? Miele has long been an organization associated with the highest quality dishwashers available anywhere on the market. Despite remaining somewhat under-the-radar when compared to big name manufacturers, Miele consistently rates higher in customer satisfaction and design quality with machines that are built to last for twenty years, twice as long as their competitors. In addition to their build quality, Miele dishwashers offer a diverse range of high-end features built to streamline the washing process and make your experience as a user more pleasant, easy and effective. Speaking of features, 2017 marks the 30th anniversary of the introduction of their patented cutlery tray that revolutionized the outdated, cluttered and ineffective cutlery baskets that are still in use in many lesser machines. And in classic Miele style, they’ve taken this opportunity to update their cutlery tray even further. But the improvements Miele has made to their 2017 line of EcoFlex dishwashers don’t end at the cutlery tray. 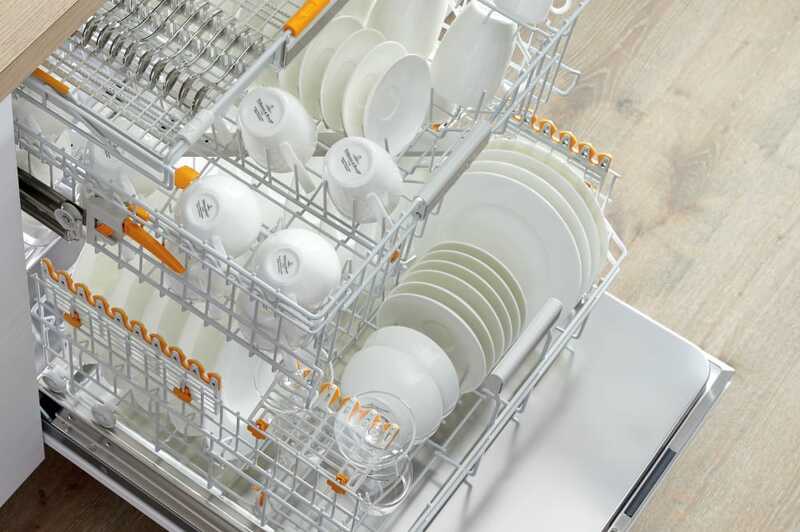 Miele is known for the restless pursuit of improved dishwashers, though they tend to opt for an incremental approach rather than completely redesigning their machines year after year. These measured changes lead to Miele dishwashers being at once familiar and new with each new line. That’s because having the best dishwasher available anywhere on the market means dramatic changes aren’t necessary—it’s the focused, targeted improvements that delight customers most. On the market. Here are some of the new features that Miele has introduced to its product line for 2017. Miele’s newly updated cutlery tray offers a dedicated, full-spray arm to ensure top-notch cleaning, increased lower basket capacity for large items and big loads as well as easy and hygienically designed loading and unloading functionality. Built to be extremely versatile, the 3D+ cutlery tray allows for customizable variation in width, height and depth to allow for a diverse range of load types. The hinged rows of upturned spikes in the middle provide even more space for large items like cooking knives or servers. It’s all topped off by adjustable sides that can even fit tall items like long-stem glasses. It all adds up to a versatile tray with maximum cleaning results. This year, Miele has taken profound strides in increasing the connectivity of their dishwashers. Their MobileControl function allows users to keep tabs on their Miele machine and even control it remotely. Users have the power to remotely check on the status of a cycle and choose & begin wash cycles from anywhere. All users need to do is download the Miele@Mobile app and find their dishwasher’s signal which will be named “Miele@home”. Usually, dishwashers that feature a quick-wash cycle sacrifice the quality of the cleaning for the sake of a faster cycle. This means still-soiled, dry or streaky dishes . But Miele’s Quick Intense Wash feature provides something truly revolutionary—a quick wash cycle that actually cleans and dries dishes effectively. Independent testing has showed that Miele’s quick cycle can achieve the best cleaning and drying results available in under one hour. As a comparison, a normal run cycle for the average dishwasher is approximately two hours. Miele’s 2017 products can achieve the same result in half the time. It can often be difficult to easily determine which dishwasher elements can be raised and lowered and which ones are fixed or locked in place. We’ve even heard horror stories about customers who end up breaking their dishwasher baskets after trying to push or pull a section into place thinking that it’s built to be adjustable. Conversely, some customers own their dishwashers for years without realizing they could have been taking advantage of adjustable or flexible tines. Thankfully, Miele has solved this issue by including FlexiAssist markings in all of their EcoFlex dishwasher models. These markings ensure that any user can quickly identify which elements of the dishwasher can be adjusted or repositioned, and even include helpful icons to show how best to use the individual tine and section types. Meanwhile, the FlexiAssist markings also serve as leverage points for bringing easy adjustment in a flash. Miele’s EcoFlex update is an impressive, though incremental, improvement of Miele’s Futura line of dishwashers. It adds increased flexibility, improved convenience and even more Miele sophistication and design. For additional questions about Miele or the new EcoFlex lineup, check out Designer Appliances Miele Dishwashers. On this link you will also notice a quick comparison chart to make selection easy for you.